Pumpkins. What is their allure, anyway? I’m not referring to the pumpkin spice latte revolution, or the intoxicating effect of a pumpkin muffin, or blessed be, the coma-like bliss that follows a piece of pumpkin pie. I’m talking about the pre-slaughtered pumpkin in its unedited form. The one we travel miles to procure at the nearest pumpkin sweatshop patch, where we fight the crowds to capture a single photograph of our precious children looking like Autumn Angels amidst a bunch of relatively tasteless vegetables (those delicious lattes and muffins AREN’T EVEN MADE FROM REAL PUMPKINS YOU KNOW). And it works! Those photos never fail to please. Even the most rotten child would look like a saint sitting next to a pumpkin. You would never know that my oldest daughter is actually in the midst of a Turd Ferguson-style temper tantrum and just told me I was the “worst mother ev-er.” All you see is tenderness, gentle souls, and pumpkins! Ahh pumpkins. Gourds of glee. It’s impossible to resist their enchanting ways. Even Creepy Baby looks like an innocent cherub when flanked by pumpkins. I’m so pleased with this setup that I’m going to leave her on my doorstep like this until Christmas. 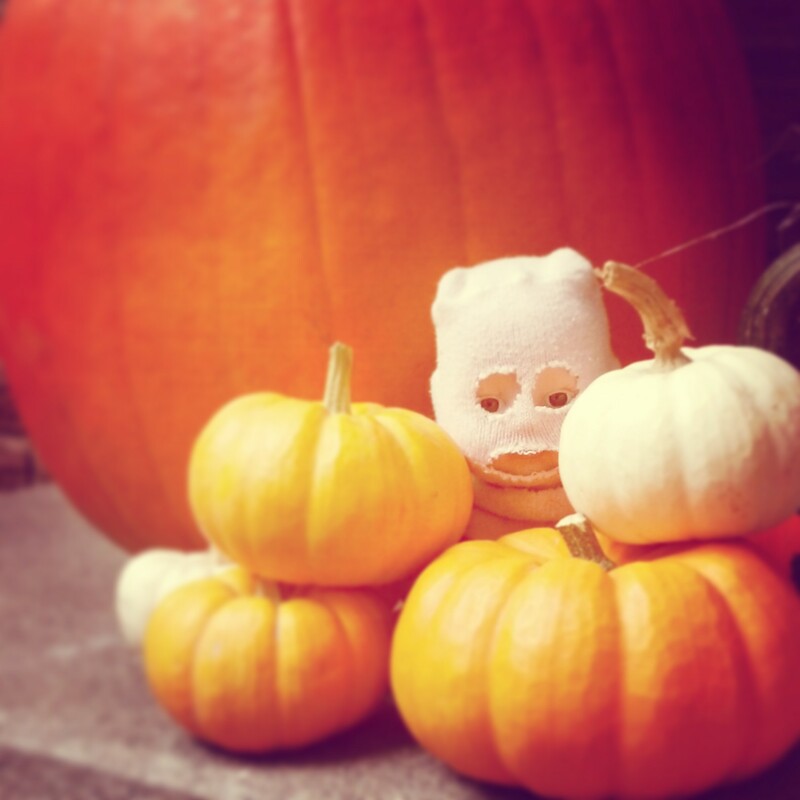 This entry was posted in Uncategorized and tagged Creepy Baby, Halloween, pumpkins by BananaWheels. Bookmark the permalink. LOL!!!! I thought that was a real baby at first! And I don’t know either. Maybe it’s the soothing color of orange? I love them in all of their round cpmpleteness. We don’t even bother carving here. Little people with knives just does not do it for me. Turd Ferguson! I’ve never met someone else who said that other than my husband and me. We don’t carve until right before Halloween, and then they are instantly covered in fruit flies. It’s heavenly. I’m a sucker for the tiny pumpkins and gourds though. Oh my! You took me by surprise at the end. I am so delighted! You, my friend, are hilarious. I am so glad you discovered the Internet and invented creepy baby. This whole pumpkin obsession is kind of weird. My daughter yelled out, “Don’t kill it!” right before I stabbed the knife into the top of ours. I can only imagine I looked like a serial killer right before I made the first cut. 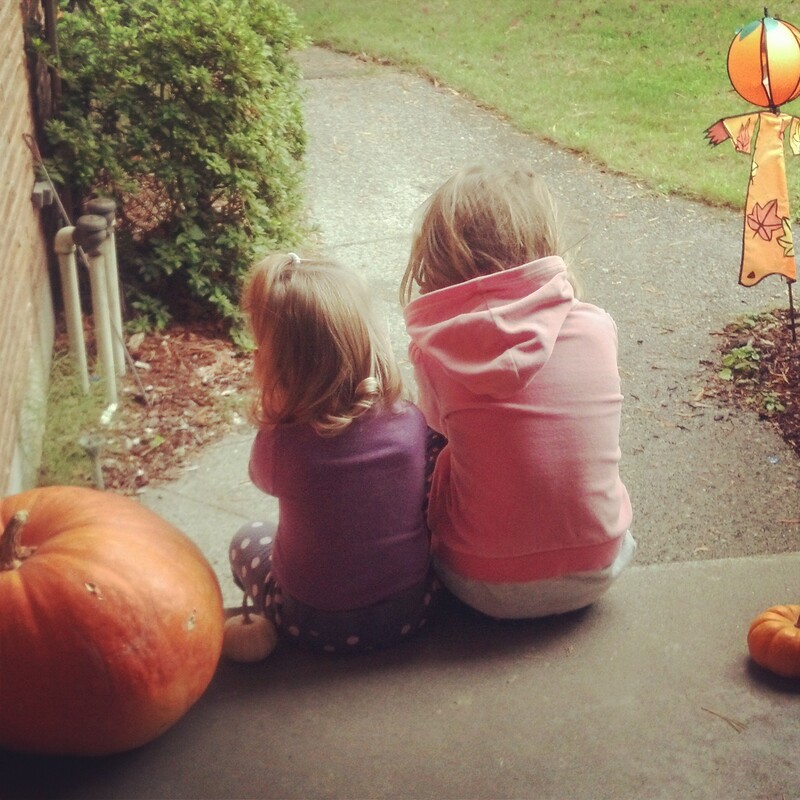 Then all of the begging to sit by the pumpkin for just a second to snap the picture…and the kid not sitting still! The determination to make it all look like we are actually having fun…haha! We are a strange group of people, aren’t we? The knives and carving definitely add another disturbing layer to the madness. Oh, Creepy Baby, how I love you so!